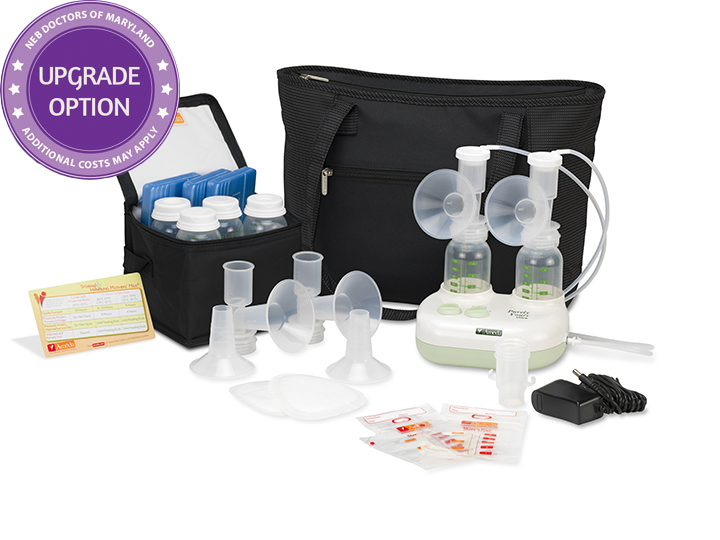 Whether mom is returning to work or wants a fast and easy pumping experience the Ameda Purely Yours Ultra™ Double Electric Breast Pump, designed for daily use, is the ideal pump. The portable breast pump (motor weighs just one pound) and the new lightweight Dottie Tote allows mom to discreetly and conveniently carry her pump. Introducing the NEW Dottie Tote, a fashionable bag made from premium fabric with a stylish pattern design. The versatile shoulder bag has an outside zipper pocket to hold a cell phone and an interior pocket to keep small pump parts handy. Easy to clean inside and out with a damp cloth. The Dottie Tote is perfect for the on-the-go mom. PURITY Proven Airlock Protection™ barrier helps protect milk while keeping pump tubing dry and clean. No need to clean the tubing. CUSTOMIZATION CustomControl™ empowers moms to more closely mimic their baby’s nursing rhythm. Moms have complete control of their cycle, both suction and speed, to select the best levels for their milk flow and comfort. COMFORT The smooth, rhythmic waveform creates a gentle sensation, so pumping feels comfortable, allowing mom to relax and make more milk for her baby. Qualify for the Purely Yours Ultra Breast Pump through insurance.